We might not let a trophy tell us how nice we are, but it’s sure is nice when a trophy does. 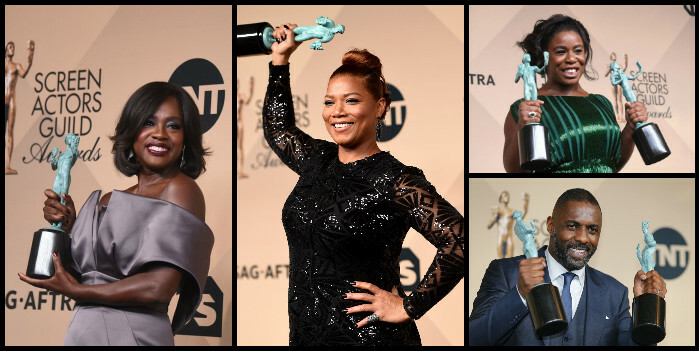 The Screen Actors Guild (SAG) Awards were held this weekend and some of our favorites walked away winners. Idris Elba took home the Outstanding Performance by a Male Actor in a Supporting Role award for his work in Beasts of No Nation as well as the Outstanding Performance by a Male Actor in a Television Movie or Miniseries for Luther. Idris is not only the first male to take home two individual SAG awards, but also the first Black actor to do so. Uzo Aduba won the Outstanding Performance by a Female Actor in a Comedy Series statue for her role as Crazy Eyes in Orange is the New Black and also received a second trophy for Outstanding Performance by an Ensemble in a Comedy Series for being part of the Orange is the New Black cast. Viola Davis was awarded the Outstanding Performance by a Female Actor in a Drama Series trophy for her role in How to Get Away with Murder while Queen Latifah took home the Outstanding Performance by a Female Actor in a Television Movie or Miniseries statue for her starring role in Bessie. ABC gives Shonda Rhimes the entire Thursday night TV show block for fall.